The Remembrance of the Miracle, worked by the leader of the Heavenly Hosts, the Archangel Michael, at Chonae. In Phrygia, not far from the city of Hieropolis, in a place called Kherotopos, there was a church named for the Archangel Michael, and outside the church flowed a health-curative spring. This church was built through the zeal of a certain inhabitant of the city of Laodicea in gratitude to God and to the holy Archangel Michael, who had appeared in a dream vision to this man – the father of a mute girl, and who then had not yet been illumined by holy Baptism, and revealed to him that his daughter would receive the gift of speech in drinking from the water of the spring. During her drinking the girl actually did receive healing and began to speak. After this miracle, the father with his daughter and all their family were baptised, and in fervent gratitude the father built the church in honour of the holy Archangel Michael. And for healing began to come to the water-spring not only Christians, but also pagans. In so doing, many of the pagans turned from their idols and were converted to the faith in Christ. At this church of the holy Archangel Michael a certain pious man by the name of Archippos served over the span of sixty years as church-attendant. By his preaching and by the example of his saintly life he brought many a pagan to faith in Christ. With the general malice of that time towards Christians, and even moreso against Archippos, who had never forsaken the church and gave example of a real servant of Christ, the pagans gave thought to destroying the church and at the same time kill Archippos. Towards this end they made a confluence of two mountainous rushing streams and directed its combined flow against the church. 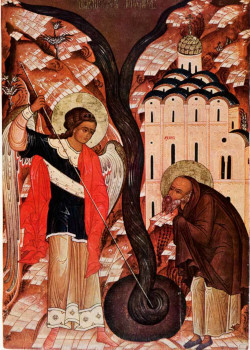 Saint Archippos prayed fervently to the Archangel Michael to ward off the danger. Through his prayer the Archangel Michael appeared at the temple, and with a blow of his staff opened into the mountain a wide fissure and commanded to flow into it the rushing torrents of water. The temple thus remained unharmed. In beholding such an awesome miracle, the pagans fled in terror, and Archippos together with Christians gathered in church glorified God and gave thanks to the holy Archangel Michael for the help. The place where the miracle happened received the name “Chonae”, which means “opening” or “fissure”.